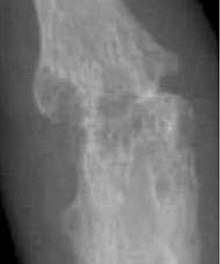 Closeup of bone erosions in rheumatoid arthritis. ↑ Kelly, Janis (22 February 2005) DAS28 not always a reliable indicator of treatment effect in RA Archived 2011-02-25 at the Wayback Machine., Medscape Medical News. ↑ 95,0 95,1 95,2 DiPiro, Joseph T., Robert L. Talbert, Gary C. Yee, Gary R. Matzke, Barbara G. Wells, and L. Michael Posey (2008) Pharmacotherapy: a pathophysiologic approach. 7th ed. New York: McGraw-Hill, 978-0-07-147899-1.